Welcome to the The Mindful Teacher. This is a website that is designed to provide a virtual community of inquiry and practice for all educators who are seeking more mindful and humanistic schools and systems. This website is organized into three sections. The first section is entitled “Practice.” It provides resources, including guided meditation tapes that are specifically designed for educators to assist us with calming our bodies and focusing our minds before, during, and after school. It also provides reviews of mindfulness apps and other resources for meditation practice. The second section is entitled “Learn.” It provides access to new research on mindfulness and education. Some of this research will have a focus on the impact of new technologies on our schools and systems. Additionally, it will explore whether or not it is possible and desirable to use new technologies mindfully in schools. 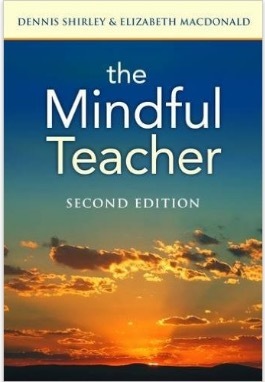 It also includes interviews with teachers and researchers that explore mindfulness from a variety of perspectives. The third section is entitled “Connect.” Here we will provide you with prompts to support dialogue and exchange with other educators about our efforts to support greater mindfulness in education. We especially welcome comments from educators who find creating more mindful classroom environments to be challenging. If we are honest and open about how difficult this can be in our schools, we can provide greater levels of support for one another. We face many challenges, and have many great opportunities, in the education profession today. The Mindful Teacher seeks to provide a new space to explore those challenges and opportunities with one another. Thank you for your interest and for your dedication. Enjoy! Dr. Dennis Shirley is Professor of Education at the Lynch School of Education at Boston College, Editor-in-Chief of The Journal of Educational Change, and Chair of the Special Interest Group (SIG) on Educational Change of the American Educational Research Association (AERA). His work in education spans from the microlevel of assisting beginning teachers to the macrolevel of designing and guiding research and intervention projects for school districts, states and provinces, and nations. For 6 years, Dennis led a teacher inquiry seminar project with teachers from the Boston public schools (BPS). This group met regularly to reflect, meditate, and dialogue about the joys and challenges of teaching. This project's story and results have been published in The Mindful Teacher. Further, Dennis has written on mindfulness and technology in K-12 education both in the U.S. and abroad. These two areas of interest, as well as many conversations with teachers, principals, and educators, have resulted in the creation of this website as a place to present research, resources, and a place for discourse on mindfulness in education. In addition to his work with The Mindful Teacher, Dennis and his colleague, Andy Hargreaves, are working on a $500,000 grant with Education Northwest to improve rural schools in Washington, Oregon, Alaska, Idaho, and Montana. Previously he served on a team for the Organization for Economic Cooperation and Development (OECD) studying improvements to lower secondary education in Norway. The findings of much of his international research are presented in two books with Andy entitled The Fourth Way: The Inspiring Future for Educational Change and The Global Fourth Way: The Quest for Educational Excellence. Dennis has presented his research and led professional development workshops in Australia, Austria, Belgium, Brazil, Canada, Chile, Ireland, Germany, Mexico, Norway, Singapore, Spain, Sweden, Switzerland, South Africa, and the United Kingdom. He is planning future engagements in Australia, Canada, Chile, Germany, Malaysia, Norway, Singapore, and Sweden as well as several cities in the United States. He earned his doctorate from the Harvard Graduate School of Education. You can email Dennis Shirley at shirleyd@bc.edu or follow him on Twitter at @dennisshirley. His website can be found at http://www.dennisshirley.com/. Tim Lindgren, Instructional Design and eTeaching Services at Boston College.